Aburi Sanma Nigiri Zushi ('炙り秋刀魚[サンマ, さんま]握り寿司', is classified into sushi), is known as Lightly Broiled Pacific Saury Nigiri Sushi in English, and 炙烤秋刀鱼 握寿司 (Zhì kǎo qiū dāoyú wò shòusī) in Chinese. It is the washoku. 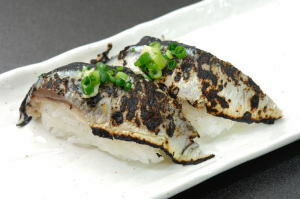 Lightly Broiled Mackerel Pike Sushi. *If fish is not very fresh, you may have diarrhea. 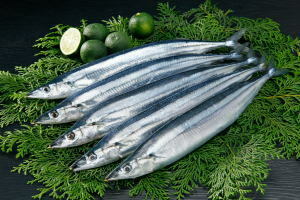 Aburi Sanma Nigiri Zushi is a hand-formed sushi that set lightly broiled pacific saury on a formed sushi rice. We can eat this dish at special sushi restaurants in Japan.